Leave the Leatherman Alone | Let the Connecticut and New York Legend Rest in Peace! Will the data from the testing be in the public domain, or privately held? 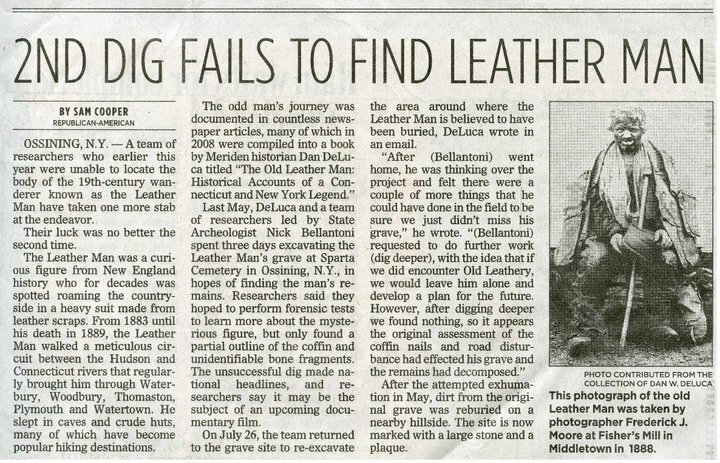 Would the owners consider keeping the data unpublished until a potential “heir” came forward with substantial proof that they were indeed related to the “Old Leather Man”? Will the data be made available to any interested party for independent research? The alternate scenario of finding no organic material to test makes all these questions a moot point. Of course, it’s the one I’m hoping for. But all I can do until Wednesday, is think back to that famous Geraldo Rivera T.V. special with my fingers crossed. The Ossining Historical Society announced Wednesday that the exhumation will take place in the next couple of days. The article about it is here. It appears a press conference to share their findings, followed by a funeral, will take place next Wednesday, May 25. The funeral part is still puzzling to me, due to the fact that in their court petition, it states “Petitioner has no knowledge of any religious preference of the Decedent“. Of course, they further state in seeking approval to take “anatomical gifts” to conduct the DNA testing that, “Petitioner has no knowledge that any such anatomical gift would be contrary to the religious or moral beliefs of the Decedent“. Despite evidence that he carried a prayerbook, wore a crucifix, and took no meat on Fridays, they have used the lack of evidence of religious beliefs as a rationale for performing the tests while they have access to his remains. But then “out of respect” there will be a funeral? The juxtaposition of these two events will never sit well with me. For what it’s worth, I do not plan to be there, or join in this misguided portion of the Leather Man’s journey. Maybe the old earth which he communed with for all the years while he walked among us, and ever since, will have already returned him to the dust from which he came. Only then, would he finally be free to roam in the shadows and the wind, forever mysterious and unknown. I believe that the Leather Man’s DNA is his property, and he went to unimaginable lengths to guard his identity during his life. Curious strangers should not be allowed to take co-ownership of it 122 years later, just because he’s dead, and they can. The most effective way to let the team know how you feel about this project is by contacting them directly. Despite hundreds of votes and comments here and in local media in support of “Leaving the Leatherman Alone”, Norm MacDonald – OHS President, said he had only heard directly from one person as of April 2, 2011. I had hoped that the comments and data presented here on the site would be taken into consideration, but it appears only personal contact is considered a valid form of feedback. Contact info is located under the Activism Now tab. I mailed the following letter on April 7, and I hope it sets the record straight on what “Leave the Leatherman Alone” means to me. I am writing to you in regards to the “Leather Man project”. I would like to clarify what I believe are some misconceptions about objections to this project that I have raised publicly through a website, and interviews in the local media. First I want to state that I am in no way intending to discredit the good work that your organization, or any other Historical Society does to help preserve our past. As a history teacher and private citizen I consider Historical Societies to be local treasures, and an invaluable resource to our communities. I also believe your goals in this project are well-intentioned. I have visited the gravesite, and wholeheartedly agree with your decision to take action to improve the public’s safety when visiting Sparta Cemetery. The relationship between the current access road, Rt. 9, and the Leatherman’s gravesite is a potentially dangerous one, and I applaud your decision to remedy it. I also believe that a new memorial for the Leather Man is a fine gesture, which would serve your mission of promoting interest in, and preserving local history. So when I say we should “Leave the Leatherman Alone”, please understand that I am not suggesting that these two parts of the project be halted. I am in full support of them moving forward. I would also like to add that I have questioned only certain types of work being done, not the quality of the work. The involvement of Dr. Nick Bellantoni assures that the project will adhere to the highest standards of professionalism. I remain opposed to any forensic testing of the Leather Man’s remains that involves the taking and subsequent destruction of anatomical gifts to expand the historical record. By extracting his DNA and other organic material from within his bones and teeth, the very essence of who he was will be removed and analyzed scientifically in a laboratory. The result will be that the personal information he went to unimaginable lengths to keep within himself will be taken ownership of, and then made public. These are actions that can never be undone. One only needs to read the most basic research on the Leather Man to know that he did not willingly share this type of information while alive, so what makes taking these drastic measures acceptable now that he is supposed to be “resting in peace” at the Sparta Cemetery? In the court petition, it is implied that since he never spoke of religious or moral views, or his genealogy, we are unaware of any personal beliefs, or family members that could raise an objection to the forensic testing. I take umbrage at the fact that his preference to remain private through silence is now being used as justification for strangers to gain access to that personal information and share it with the world. The way I read this is: Since he never spoke, we don’t know if he or any potential family members would object to this, so let’s just assume he wouldn’t object and take these “gifts” from him in the interest of expanding the historical record. I believe it is obvious that his actions spoke louder than words ever could, and they indicate loud and clear that he preferred to remain anonymous. Rationales have been provided such as: We can learn so much through this, we may find out he was autistic, heirs may come forward, we can finally give him a voice, and he can now be given a proper Christian burial. That last one seems to contradict the original court filing which states: “Petitioner has no knowledge of any religious preference of the Decedent”. 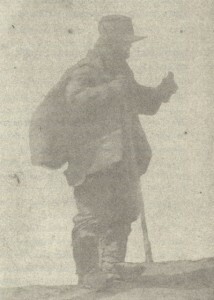 Team members have been quoted as saying “I would like to see him identified, It would be quite a find.”, and “I want to know. It is to solve the mystery.” I believe as stewards of the Leatherman’s remains interred at Sparta Cemetery, that more weight should be given by the OHS to the unique legacy of this intensely private individual. The mere availability of 21st century technology coupled with historical curiosity should not allow us to impose our will on him because he chose to live alone and quietly outside of society’s norms. He was a common man, with an uncommon way of life. For me, and hundreds of others, in the case of the Old Leather Man, the ends do not justify the means. The word autopsy literally means “See for yourself”, which matches the rationale for this project perfectly. The goal of the forensic testing is to “see for ourselves” what secrets the Leatherman kept private during his solitary trek. However, with all due respect, I submit that taking anatomical gifts from the remains of the Leatherman after 122 years, is much, much more, and it crosses a line. There is a small heart on my driver’s license that will indicate my wish posthumously to be an organ donor. The dead do have rights, and in this case, ‘Ol Leathery has left us an unrivaled thirty year record of intentionally keeping those secrets tucked safely away in his innermost being. I am not alone in believing they should remain there for eternity. 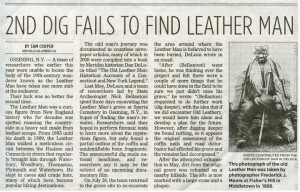 To achieve the goal of expanding the historical record of the Leatherman, there is still work that can be done following the excellent model given us by Dan Deluca, and others before him. I believe in research that takes place above ground, and explores the breadth and mystery of the Leather Man’s journey through our communities so many years ago. We should map his footprints, not his DNA. I also believe someday he will be identified. And when that happens, I will read all about it because I too want to know. I sincerely hope and pray that it is never done at his expense. Therefore, I again kindly ask you to please reconsider using any organic material from his remains to further unravel the mystery and legend of the Old Leather Man. Ironically, the same technology that has given this movement momentum, can also get it stuck in the mud. It is now very clear that the kind of activism needed here is the “Old School” tangible, soapbox on the ground, community involvement type. Let’s face it, for some people (myself included), clicking a button to vote in a poll, or posting a comment is much easier than composing a letter, finding a stamp and an envelope, and bringing it to the mailbox. For what it is worth, the OHS will be getting their second letter of opposition this week, and I will post a copy of it here at this site. We are at a nexus in the movement to “Leave the Leatherman Alone”, and it is one that mirrors societies acceptance of online movements as valid indicators of public opinion. If anyone reading this would like to commit to help in shifting the focus to local community activism, please post to the wall or guestbook, and I encourage you to get involved in this in the local community. I am an hour and a half away, and am thus limited in my ability to be “there”. I would ask that anyone who visits this site keep this in mind moving forward. Historical Societies are local treasures, and the work that their volunteers do to preserve the legacy of our past is invaluable. A DNA Test Six Years In The Making: What’s really going on? 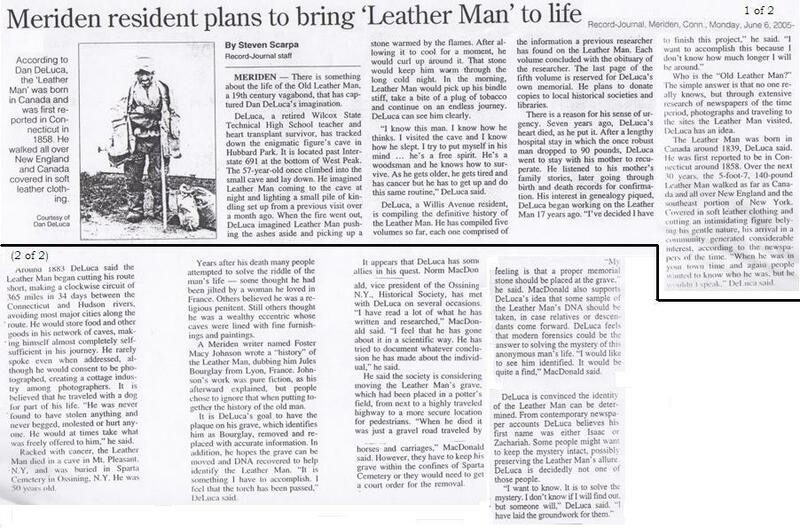 I recently discovered a very informative newspaper article about the “Leather Man” from June 2005. The article describes a plan to take a DNA sample from the Leatherman to help in “…solving the mystery of this anonymous man’s life”. It goes on to say that DNA could “…help identify the Leather Man.” The two people describing this plan to the reporter in June 2005 are Dan Deluca and Norm MacDonald, two of the principals in the current project. Here are their exact words then, and now. Another point of interest is the acknowledgement by Mr. MacDonald that in 2005 pedestrian safety was already an issue at the gravesite, so the OHS was considering moving the grave. Then comes this statement: “However, they have to keep his grave within the confines of Sparta Cemetery, or they would need to get a court order for the removal.” Yet it has taken almost six years to address the safety issues. Does this have anything to do with Deoxyribonucleic acid – aka DNA? Putting all of these statements in perspective paints a clear picture for me of what is really going on here. It is and always has been about the forensic testing and the DNA to solve the mystery and identify the Leather Man. The safety issues could have been resolved long ago, but getting approval for DNA extraction from the Leatherman’s remains has had an undeniably strong role in determining the pace of events. Once again, I ask: Will someone from the team lay this all out for us and show how from start to finish, the public’s best interests are being served?